Fix or remove waiting for activation error in imessage: in this post I am going to tell about how to fix or remove aticativation required error in iphone and ipads. 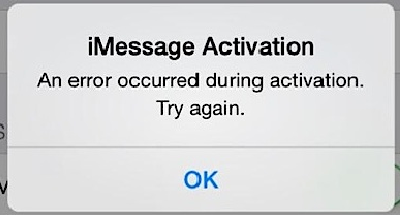 Most of the times when you try to use imessage it gives this annoying error “waiting for activation”. This problem is very common among various iphone and ipad users all over the globe. Below I have given some common solution to fix waiting for activation error in ios. You just need to hold your iphone or ipad and start reading the procedure given below. I do not gurantee that which method will be helpful to you to fix waiting for activation error. You must hit and try each method and I hope that one of the methods listed below will help you to fix waiting for activation error in your iphone and ipad. Before giving you the solution to resolve the error. Let me first tell you something about what causes this waiting for activation error. Most commonly this error is caused due to network issues. If this is the case then it can be resolved easily by switching to new network. Using older version of ios. Also if you have not upgraded your iphone 3gs, 4, 4s, 5, 5s to latest ios version you can get this waiting for actiation error. Even ipads, ipad 2, ipad mini or even ipad air could show this error due to old operating system. You don’t need to worry. Here we have given you some of the best possible ways to remove waiting for activation error in imessage. Below are 5 solutions to fix waiting for activation error prblem. This method generally do not require any change of setting to fix activation error in. You are just adviced to connect your iphone or ipad thorugh wi-fi connection only. Sometimes imessage doesn’t activte on some cellular connections. So, always try to connect through wi-fi. If this method doesn’t work read other solutions given below. As said earlier if your iphone3gs, 4, 4s, 5, 5s and ipad models like ipad, ipad 2, ipad air etc. are running on older version of ios you shold upgrade it to the latest versions. Update it to the max. possible latest version of ios. Settings> mail, contacts and calenders. Scroll to contact sections and click on my info. Select yourself as contact card from the list. By doing this you will make imessage identify your number and email address. This method has also helped many in removing waiting for activation error in imessage. You just need to reset the network settings. This will resolve out connection error (if any). Settings > general > reset > reset network settings. Once you have reset your network settings reboot your device. After this imessage should run smoothly. Although I do not advice anyone to go for this method. But this is the last option that you can opt to solve your problem. Just erase everything and restore. This method is same for iphone 3gs, 4, 4s, 5, 5s and all models of ipad, ipad 2, ipad mini and ipad air. When you reset your device all data will be deleted, so backup all your important data using itunes or icloud. Settings > general > reset > erase. This will make all content and settings to factory restore. Just confirm the reset and wait till it restore. I hope methods given above will help you to remove imessage activation error. If you face any problem and have any other solution do tell us by commenting below.